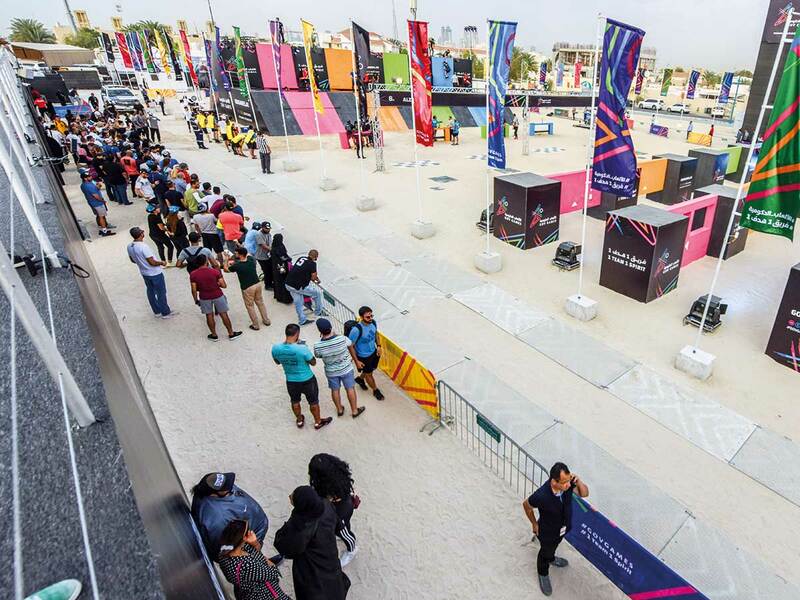 Dubai: Testosterone raged at Kite Beach on Thursday as the men’s teams were off to an explosive start for the first of the two-day qualifying rounds of the second Government Games (GovGames) in Dubai. The afternoon heat proved nothing for the competing teams who were all vying to make it to the finals and bring home Dh3 million in prizes on Saturday. The GovGames was launched to promote team spirit and a healthy lifestyle in the government sector in the UAE and abroad. His Highness Shaikh Mohammad Bin Rashid Al Maktoum, Vice-President and Prime Minister of UAE and Ruler of Dubai, was present during the second day of the competitions to show his support. A total of 102 teams of men are competing on Thursday and Friday. Shaikh Hamdan Bin Mohammad Bin Rashid Al Maktoum, Crown Prince of Dubai and Chairman of Dubai Sports Council, led his F3 team and finished the first obstacle assigned to them, the Power Drainer, in just half the time required at 5min6sec. They had to jump over a wooden obstacle, climb a rope and cross two rubber mattresses suspended in the air before climbing down on a web of rope. The obstacle tested team members’ balance, mental ability and strength. There are a total of nine obstacles. The Alzheimers Obstacle, which seemed simple in the beginning, tested the endurance of all the teams. 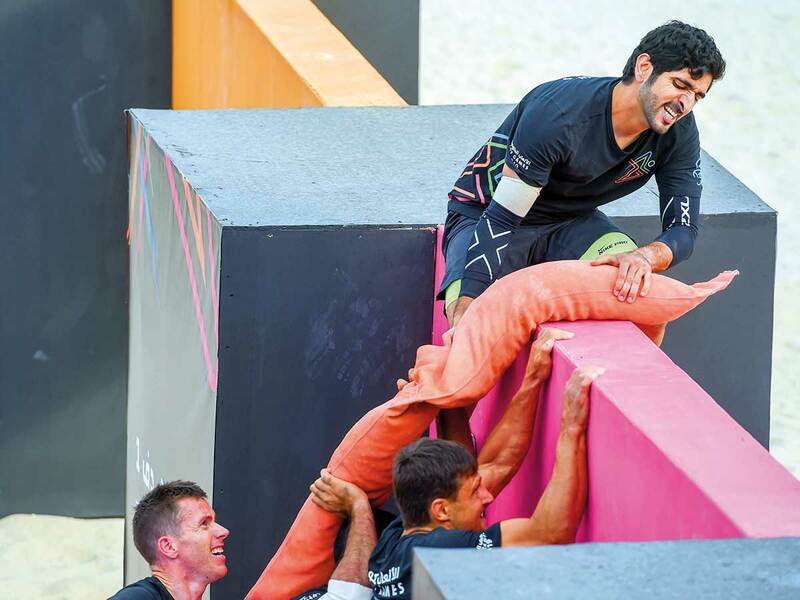 Shaikh Hamdan and his team were seen carrying a long sand bag over wooden obstacles to finish first. The F3 team battled head-to-head with the Ministry of Defence on the first day. Dubai Electricity and Water Authority came in third as of 6pm. Halfway through the competition, competitors could be seen with minor cuts and bruises but in high spirits. One participant walked around with a sling. The afternoon breeze tempered the heat by evening, which gave participants some respite. Many were wet after falling and splashing in the pool of water in some of the obstacles. All the obstacles this year are more challenging, said Omar Mansour, legal adviser at Environment Agency Abu Dhabi and second time GovGames participant. “I came yesterday to check out the obstacles and strategise but when I competed today, they all looked so different. All the obstacles are hard but I will give my best,” Mansour told Gulf News. Jasim from the National Media Council (NMC) and also a participant, agreed that the obstacles were challenging. Mohammad Zia, also from NMC, said the Human Ladder 2.0 was the hardest obstacle by far. “Our strength is on the ground. Almost all the obstacles are suspended in the air that will require upper body strength and balance. Nevertheless, they’re all good,” Zia said.